Through projects such as Travel Buddy, Quality Checkers, and Power Up, we provide our learning disabled members with paid work opportunities. The amount that we’ve paid to members has increased each financial year. 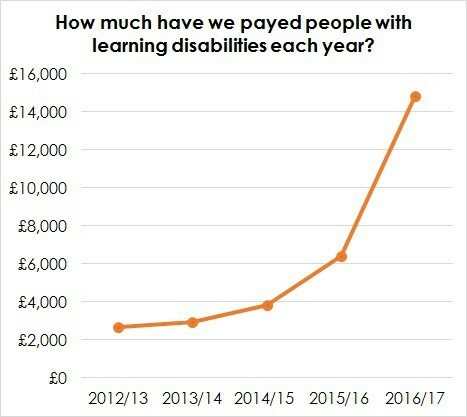 In 2012/13 we paid £2.685 to people with learning disabilities. In 2013/14 it was £2,944. In 2014/15 it was £3,845. And in 2015/16 it was £6,398. At the end of April, we worked out what it was for 2016/17. It’s a massive £14,862 – which is a 132% increase on last year! We hope to see a similar growth in our projects and the amount we can pay people happen next year. Despite the proven benefits of having a job, just 6.8% of learning disabled people using social care are in work (VODG, 2016). At My Life My Choice, we consider paying people with learning disabilities to be a core part of how we are fighting injustice.